I'm scared. Actually I'm terrified. Working on Sharon's precious Kwakker worries me because if I break something she will break me. Badly. I always like her to be with me so I can say "you pull it...". We need to access the battery as we're fitting a 12v power socket. This will allow Sharon to charge her power pack, charge her phone and most important of all - use her 12v hair straighteners. Remember the good 'ole days when the whole seat came off with the click of a key? Under the seat was the battery with easy access? Just like my CB500X? Well Sharon's Z250SL is a sporty little number with a rider and a pillion seat, angular plastic trims and more parts packed under the wrapping than a modern mobile phone. Anyhow, it's time to be brave. Remove the pillion seat. Under the seat remove the 2 crosshead bolts as shown in the image. Remove these. Under the tail piece are 4 (2 on each side) panel fixings and are located as in the image. These fixings are released by pushing the centre in with something like a small screwdriver. once popped in you'll need Sharon's fingernails to actually pull them out. Before you start heaving at the panel just note there are clips as below. 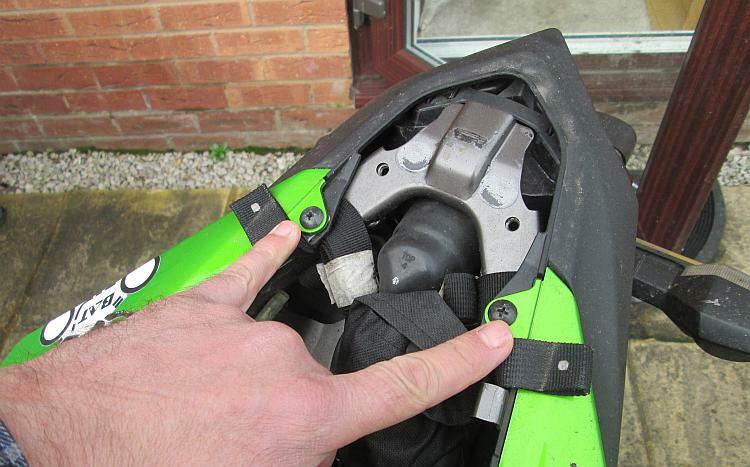 So now...very carefully we can start to pull the rear seat trim panel off the motorcycle. Carefully...gently...noticing clips and sticky out bits and lugs. With a wiggle and a pull the panel should come away from the bike. Do this for both rear panels. Note the item circled in red, there is a similar one on the other side. This holds the seat in place. 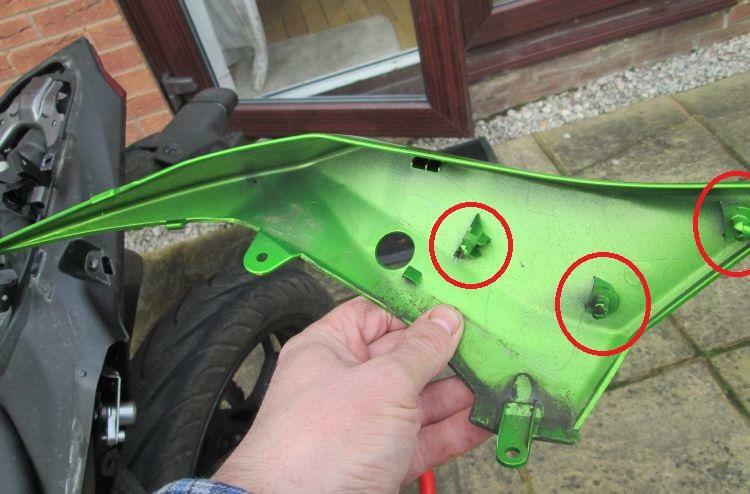 Undo the 10mm bolts and draw the seat fixing pin our from the frame. 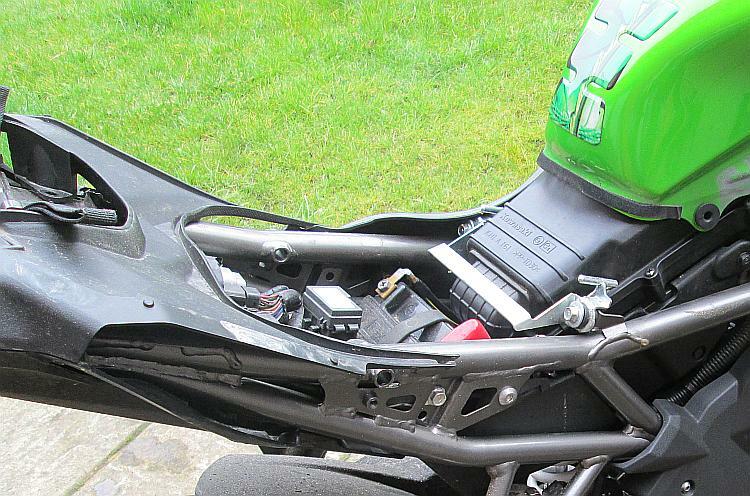 Now the rider's seat can be lifted up at the rear and slid backwards to remove it from the bike. This will finally expose the battery. And there we have it! I am still alive, Sharon's bike is not broken and I have fitted the 12v power socket. Looks like Sharon will be able to straighten that hair out right after she gets off from a long ride. Could you maybe show us how you fitted the 12V power socket? I hadn't thought to cover the actual fitment of the socket - because we barely fitted it. Simply put there were "rings" on the end of the wires that were bolted to the battery terminals on top of the existing ones. The socket merely rests under Sharon's rear seat. It's not mounted or secured in place, it doesn't seem to mind being loose. Aha, so you didn't decide to mount it so that she can charge on the go? What does she use it for? Well the PRIMARY and most important purpose of the power socket is...for...hair straighteners. I don't believe she could use these while riding. But yes she can charge on the go. I discovered the best way for myself to keep everything charged works thusly. During the day when I'm on the bike under the seat I am charging a USB power pack. I have my phone etc "to hand" rather than under the seat. Then at night the charged power pack is used to charge the phone, the torch, my e-cig and even my tablet if I have it with me. Sharon's space under her seat is barely big enough for a phone! So she too has a power pack but a smaller one. We have also now fitted a USB wire from the socket under the seat to a Sat Nav case on the bars - in case Sharon needs to Sat Nav. 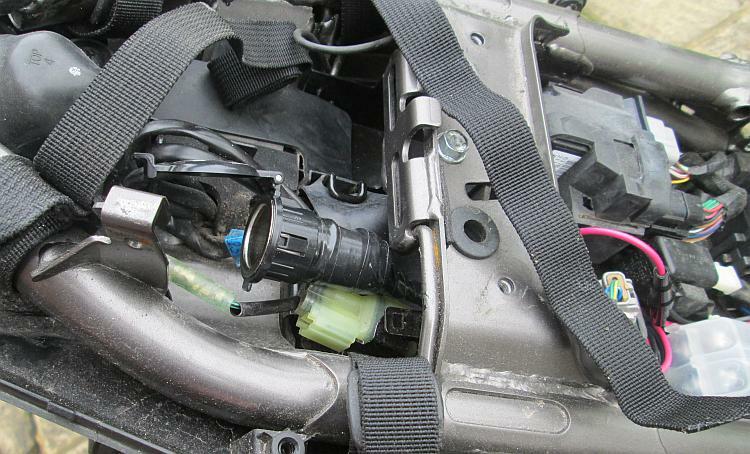 I fitted a 4 socket car lighter extension unit inside my top box. Each socket is individually switchable. I leave it permanently connected to the battery with its own inline fuse. Works well and so far hasn't drained the battery after 3 months of non use of the bike so the switches must work. Though if it was flat not exactly the end of the world. It also it allows me to charge the battery through it which I presume Sharon's can do as well. The boy's CBR500 had a battery charging connection fitted by the previous owner when he got it, different make from my charger but there was an adapter for a 12V socket available so we can now charge his bike with my charger without faffing about with the battery terminals, in fact all the family vehicles are set up for charging without accessing the battery compartment. Some have direct connections as their power socket goes through the ignition. I usually run them through a maintenance cycle around October to see if the batteries will be okay for the winter. 4 sockets in the top box?! Just how many things are you running Borsuk? I have often considered putting power (either 12v or 5v USB) into the top box but then I often remove the top box to use as a seat when I'm camping...which is when I usually need power too. I'm thinking of starting a business. Right. Right. So YOU pay me to ride your bike through the bad weather right which keeps the bike running sweetly right and the battery charged up. Right. Right. For an extra fee right Sharon will clean the bike after I've gotten it all horribly dirty right. Or you can leave it dirty right and pretend to be a real all year round all weather biker right. Yeah I'm gonna be soooooo RICH!! Normally two things max. The 4 way switchable was cheaper than the 2 way. I've connected extra tail and brake lights to the top box so it's not coming off any time soon. 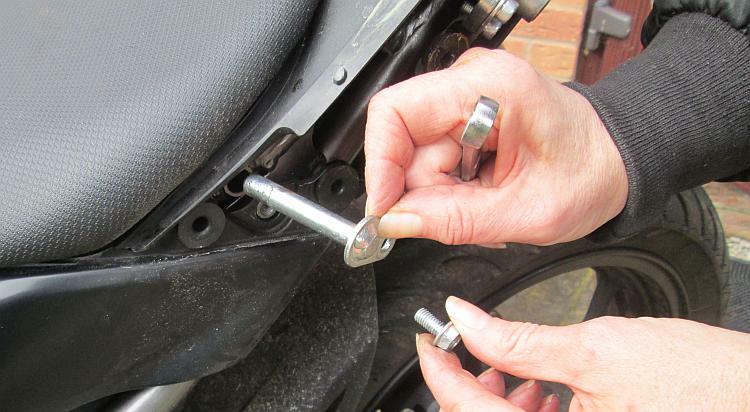 If you add the righty toughly bike service to the let me run your bike in gently service you could be onto a winner. After all who wants to run their bike for 500-1000 miles at max speed of fiftyish. Additional lighting - a subject close to my heart. As per another post the rear bulb blew on the CBF125 last week and it was good to have the extra rear LED just to get me the 4 miles home. Yes - as part of the "Ren's Bike Riding Service" we can offer a "running in" service. I will ride your shiny new motorcycle at a genteel pace for 600 miles. I'll be sure to vary the revs and ride in a variety of road conditions to ensure a thorough bedding in. Thing is I won't be TOO careful though and risk not working the engine sufficiently. It's a balance thing. If I ever buy a new motorcycle I'll be sure to talk to you then! Thanks David. It's good to know I have my first customer. All you need to do now is buy a shiny brand new motorcycle!! Haha I only have my Z250 for about a month, and I already want to go bigger! Meanwhile I also bought a USB charger for it.... Now I've got to follow your guide.